Globe-trotting archaeologist turned adventurer Mary-Ann Ochota is our newest BMC ambassador and the second to focus on hill walking. 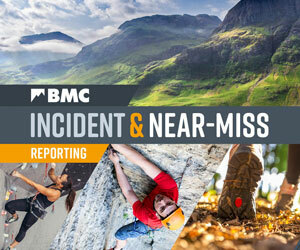 She'll be representing all things BMC at the Keswick Mountain Festival; come join her in our tipi. This year, Mary-Ann wil be joining the BMC in our tipi at the Keswick Mountain Festival. She'll be hosting a number of skill sessions alongside a Mountain Training pro, bringing you essential tips on navigation and gear that you might need in the hills. Then on Sunday afternoon, take an adventure with Mary-Ann and the Meek family on a boat journey over Derwentwater and a walk up the family-friendly Catbells. So we can arrange packed lunches and boat places, please use our online booking system to book on to the walk here. It’s fair to say Mary-Ann Ochota has a diverse CV. Among other things, she has studied at Cambridge, been quizzed on University Challenge, been a model for Special K, presented Time Team, investigated Thailand’s kickboxing kids for Channel 4’s ‘Unreported World’, and travelled the world from the Chernobyl exclusion zone to the Australian Outback. She’s also a keen outdoor enthusiast who has walked and bivvied across Britain, often accompanied by her loping pet Labrador. Last year she presented the five-part ‘Great Walks’ series on BMC TV, a spectacular short film series made in association with Marmot documenting five of the finest hill walks in the Lake District. Mary-Ann becomes the second BMC ambassador with a particular focus on hill walking, alongside renowned wilderness walker Chris Townsend. She aims to help the BMC reach more young people and women with a message about the power of getting outdoors. Keswick Mountain Festival (KMF) is preparing to kick off the UK’s 2016 summer festival season with a burst of adventure. Coming to you on 19 to 22 May. Terry Abraham, Mick Fowler, Alan Hinkes and Mary-Ann Ochota are just some of the fantastic people lined up to talk under the canvas of our tipi at Keswick Mountain Festival this year. There will also be prizes, skills sessions, inspirational talks and family walks; oh, and free drinks!